Compost is decomposed organic matter that is used in landscaping, gardens, horticulture, urban agriculture, and organic farming. Composting is carried out at the household level, in garden composters, or at municipal level at centralized composting plants. Pretty much any organic substance can be turned into compost. The most common things that are added to a compost are kitchen scraps, grass clippings, and leaves. Things like straw, hay, animal manure, tree bark, and seashells are often used to make up the composition of compost. Compost is usually mixed as follows: 2 parts dry material to one part wet material. It’s important that decomposing compost stay moist, but not wet. It can take anywhere from a few months to a year for the composting process to be completed. This is often referred to as “cooking” because heat is generated from the intense metabolic activity of fungi and bacteria feasting on the raw organic matter. The high temperatures (usually between 49 and 70 degrees celcius) also sterilize weed seeds and eliminate harmful bacteria that is found in some types of manure. More complex organisms like amoeba and nematodes consume the simpler fungi and bacteria, and then the pile begins “cooling” while the nutrients in the compost become more and more concentrated. If compost is not completed, it can have an ammonia odor to it and not deliver the desired effects. 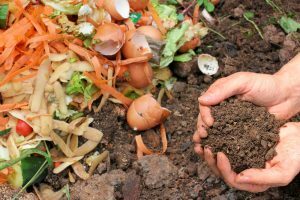 Compost is so effective because millions of microbes go to work in the soil, cycling nutrients and making them available to be taken up by the plant. When combined with the soil, the compost becomes a natural fertilizer. It is also full of micro-nutrients and other complex biology that is super beneficial for plant growth. How is compost added to lawns? It can be spread in a layer that is approx. one quarter inch thick via shovel and then smoothed out with a rake. Topdressing machines are often used on large lawns by landscaping companies. When is the best time to add the compost? It’s great to add compost immediately after seeding and aerating to give the seedlings a head start. Plus, doing this at least once or twice a year will help your lawn more than many of the quick-fix products on the market. Although those options may be more convenient, they won’t be as beneficial. You can have your soil tested to determine how much organic matter is in the soil if you are unsure if you should be adding more compost or adding it more often. Google online for a soil testing place near you. Looking for a landscaping company in the Coquitlam area? 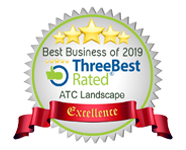 Rely on ATC Landscape – your local, professional, and eco-friendly landscape experts. This entry was posted in Gardening, Landscaping Tips, Random Topics and tagged benefits of composting, compost, composting, composting coquitlam, composting for fertilizer, composting for lawn fertilizer, cooking compost. Bookmark the permalink.